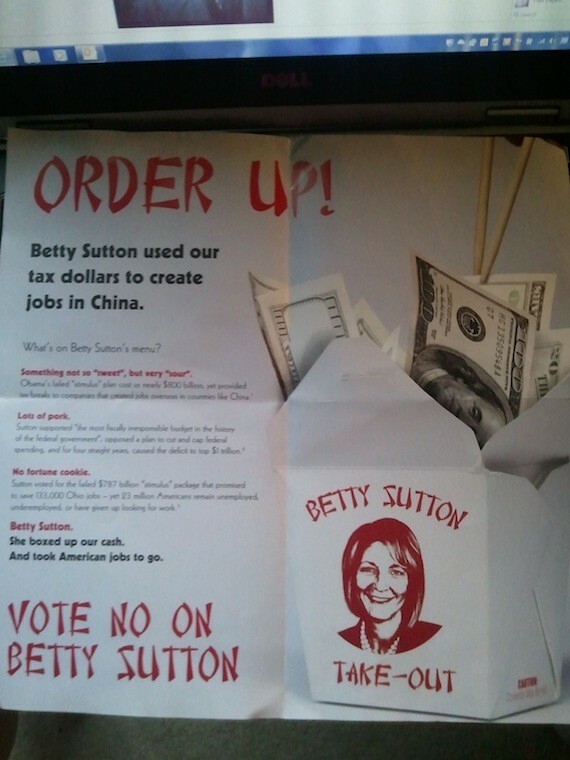 WASHINGTON -- Anti-China sentiment can be politically persuasive in the Midwest, which is still stinging from years of manufacturing jobs being outsourced. It's why President Barack Obama's super PAC spent the summer focusing on Mitt Romney's tenure at Bain Capital, accusing him specifically of being a pioneer in the field of outsourcing. It's why the Obama campaign soon followed suit. And it's why the Romney campaign, in the closing weeks, has launched surreptitious ads suggesting that, under the president's watch, America's auto companies are sending production to China. Similar accusations have been leveled in down-ballot races as well. 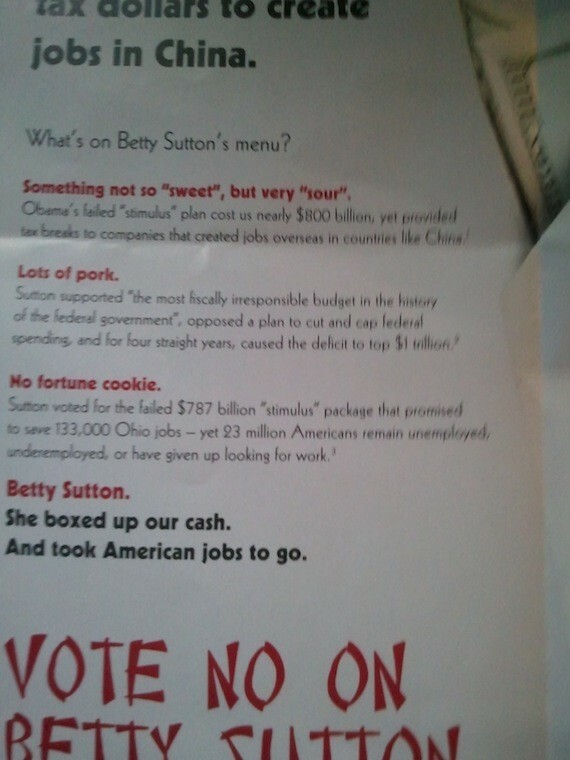 A Democratic source passed along shots of a flier allegedly being distributed by Rep. Jim Renacci's (R-Ohio) congressional campaign attacking Rep. Betty Sutton (D-Ohio) for using "our tax dollars to create jobs in China." The standard-issue line of attack in Ohio does not stand out quite so much as the insensitivity of its packaging. 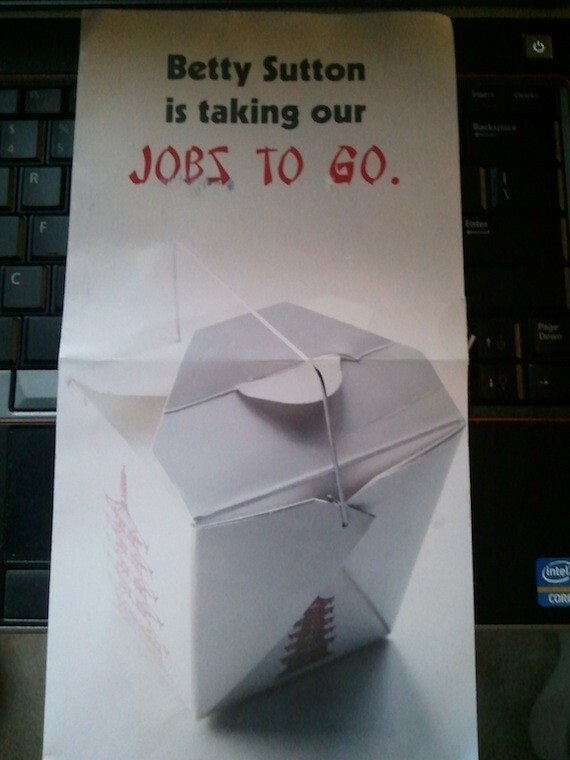 Paid for by the Ohio Republican Party, the mailer includes shots of Chinese food containers with cash, chopsticks and stereotypical Chinese-style font. Neither the Renacci campaign nor the Ohio Republican Party immediately returned a request for comment. Renacci and Sutton are facing off in one of the more hotly contested races of the cycle, after their districts were merged.